[Thomas Frognall Dibdin, bibliographer.] Autograph Letter Signed ('T. F. Dibdin') to Thomas Amyot, regarding a planned visit, with the bibliomaniac Richard Heber, to Blickling Hall in Norfolk. [Kensington postmark.] 24 July . 2pp., 8vo. On bifolium. In good condition, lightly aged and worn. Addressed on reverse of second leaf to 'Thos. Amyot Esq | 13. James St. | Pimlico', with two postmarks and a good impression of Dibdin's red wax monogram seal. He is 'solicitious' to know Amyot's movements. 'My request is, "Fly not yet." The later you go, the better for me.' He gives the dates on which he means to be in Norwich, 'to spend a day at Blickling - having written word to Churchill to that effect - to get instituted, inducted, & read myself in by the following Sunday - ye 17th. [Thomas John Dibdin, playwright.] Autograph Letter Signed ('T Dibdin') to the Pall Mall bookseller Clement Chapple, regarding terms for his 'New Opera'. With Signed Autograph Copy of Chapple's reply on reverse. 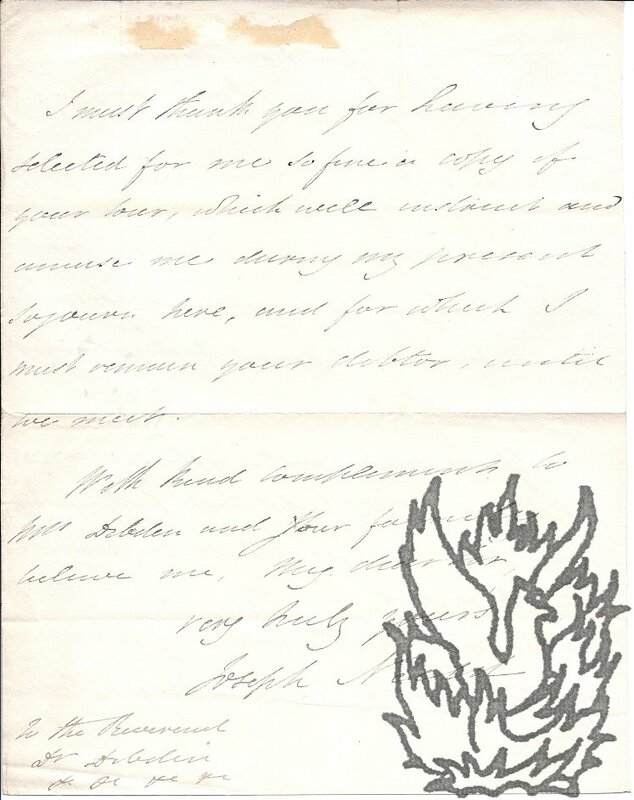 Dibdin's letter: place not stated; 'Sep 11 - mn' [dated in pencil in another hand '1824']. 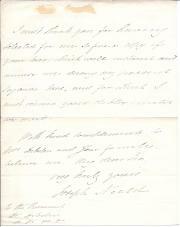 Copy of Chapple's reply: 'Pall Mall [London] Sep 12'. Dibdin's letter: 1p., 12mo. On bifolium, with the Signed Autograph Copy of Chapple's reply (also 1p., 12mo) on the reverse of the same leaf. Reverse of second leaf addressed to 'C. Chapple Esq', with a nineteenth-century shelfmark at the foot of the page: 'C.68.Coll.CR.' In fair condtion, on aged paper. Two Autograph Letters Signed (both 'T: Dibdin') from the playwright and song-writer Thomas Dibdin to his publisher John Whitaker of Button & Whitaker of St Paul's Churchyard, discussing work and finances; with an autograph cheque signed by Dibdin. The two letters: 'Weston Green 10th: July ' and 'Johnsons Coffee House | Monday Evg: [July 1812]'. 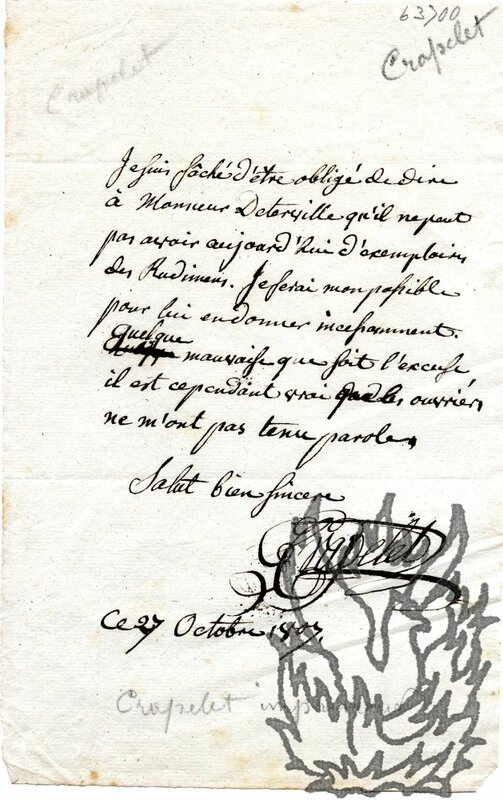 Cheque: 'London September 19th: 1817'. All three items are on stubs, within a card wallet. All good, on aged paper. Letter One: 'Weston Green 10th: July'. 1 p, 4to. On bifolium, with verso of second leaf addressed to 'Mr: Whitaker | St: Pauls Church Yard | London', with two postmarks (one 'KINGSTON - T | 12'), and docketed 'Mr; T.
Autograph Letter Signed from Joseph Neeld to Thomas Frognall Dibdin, subscribing to a 'Splendid Work'..
Grittleton House; 6 November 1829. 4to, 2 pp. Twenty lines. Text clear and complete. In fair condition, on lightly-aged paper, with minor traces of mount adhering at head of reverse. He has been on an 'interesting and agreeable' tour. 'If my name is worthy of standing amongst the Patrons of the Splendid Work forthcoming under your auspices I shall be proud to enroll myself with them; and shall be ready to obey the call of your publisher whenever you direct him to me.' 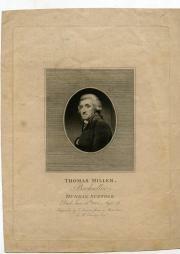 He praises Dibdin's 'Tour in France and Germany' (1821), and thanks him for selecting 'so fine a copy'. 16mo, 39 pp. Stitched. In original pink printed wraps. Text clear and complete. On aged, foxed paper with slightly dogeared corners. Minor chipping to extremities of wraps. 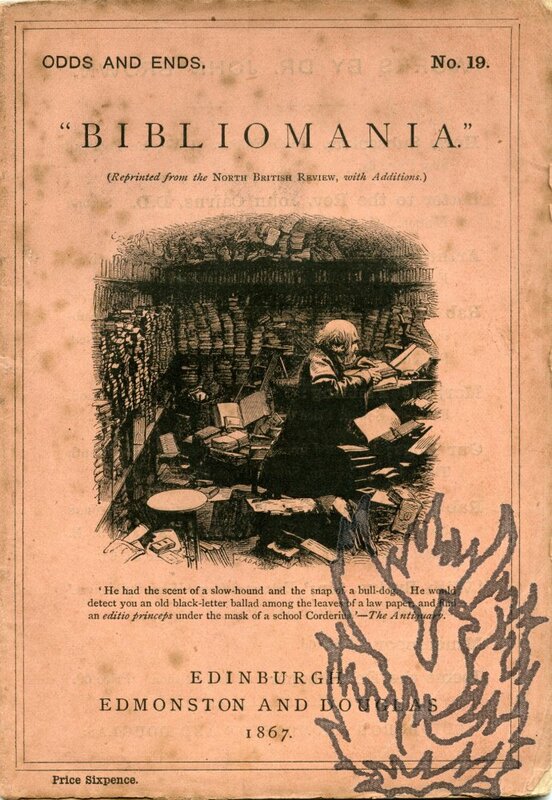 Detailed engraving (7.5 x 7 cm) by J. Adam on title-page and front wrap, showing bearded man at lectern in room crammed with books. 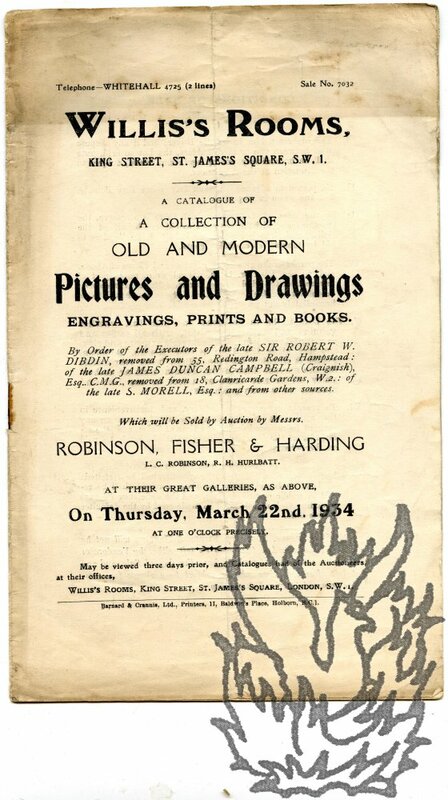 Advertisements for works by Brown (best known for 'Rab and his Friends') on inside of wraps, with list of works in the 'Odds and Ends' series on back wrap. A charming and scholarly disquisition on the subject, from a firmly British standpoint. Uncommon in wraps. 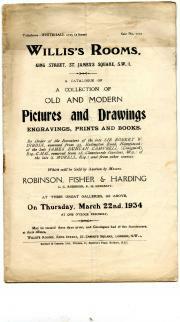 A Catalogue of a Collection of Old and Modern Pictures and Drawings, Engravings, Prints and Books. [...] the late Sir Robert W. Dibdin, [...] the late James Duncan Campbell (Craignish) Esq.. C.M.G., [...] the late S. Morell, Esq. [...]. 8vo, 12 pp. Stapled pamphlet. Text clear and complete. On aged, worn and spotted paper. A total of 204 lots. Pencil notes to lots 4, 9 and 11, with slip indicating their purchase prices, totalling £10 12s 0d. Lot 179 ('Another Property') is given prominence: 'FRANCIS COTES, R.A. A PORTRAIT OF A LADY in White Dress with Green Sash and Pink Cloak, her hair dressed high and adorned with pearls, 3.4 length | 50in. x 40in. 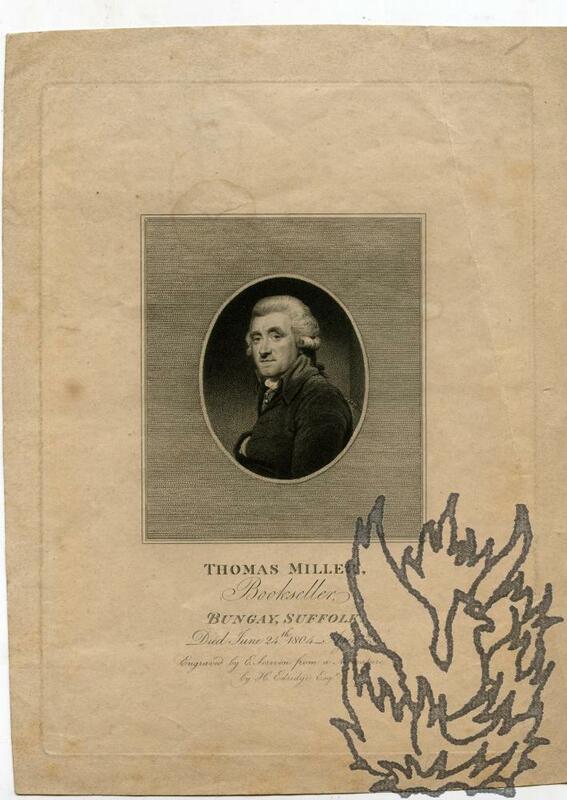 | Signed and dated 1788.' No copy in the British Library, on COPAC or WorldCat. Autograph Letter Signed to unnamed male clerical correspondent [the Rev. Dr Thomas Frognall Dibdin]. 5 S. College St. [Edinburgh] | August 5 / 37' . Two pages, 8vo. In good condition despite paper discoloration and smudging of text by author. Traces of stub adhering to one edge. An interesting letter from one of the engraver's to Dibdin's Northern Tour (1838), and important for the light it sheds on the book's production. Douglas greets Dibdin as 'Rev Sir'. He is sending his draft and has 'revised all the plates and sent them to Mr Johnstone to be proved'. Johnstone will send them on with the drawings. He has seen 'Mr. Paper dimensions 25.5 x 19 cm. Plate dimensions 22 x 16 cm. The head-and-shoulders portrait itself is oval, 7 cm high and 5.5 cm wide, contained in a square 11 x 9.5 cm, and with the caption beneath it. Printed on aged paper, with the image itself and the caption are clean and crisp, but the paper carries a crease to the margin, and there is light staining intruding into the surrounding square. 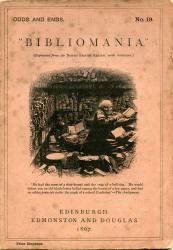 Dibdin gives an account of Miller, whose son was the noted bookseller William Miller of Albemarle Street, in his 'Bibliomania' (1811 ed., pp.630-31). 12mo: 1 p. Eight lines of text. On a piece of grey laid watermarked paper. Complete and clear. Lightly aged and creased. Unusually frank business communication. He is angry at having to tell Deterville that he cannot have 'd'exemplaire des Rudimens'. He will do his best to let him have them soon. However weak the excuse, it is nevertheless true that the 'ouvriers ne m'ont pas tenu parole'. 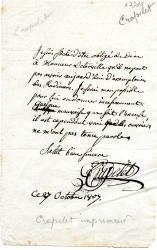 Autograph Letter Signed to Dawson Turner from his daughter Elizabeth ('E. Palgrave'). One page, octavo. Good, on aged paper with some loss to extremities repaired with archival tape. Fifteen lines of text clear and complete. On learning of Dawson Turner's celebrated collection of autographs from her son, Elizabeth Palgrave's 'kind old neighbour' Lady Bentham asked her 'some questions which led to the enclosed note & the letters I send' (none present). The Dictionary of National Biography states that T. J. Dibdin (1771-1841, closely associated with Sadler's Wells, Drury Lane and the Surrey Theatre) wrote 'nearly two thousand songs and about two hundred operas and plays'. This list, which covers the whole of his life from his earliest known work in 1789 to his death in 1841, is compiled with considerable care on the rectos and some of the versos of 79 bound and numbered leaves (most being the letterhead of the North-East Coast Exhibition, of which E. Rimbault Dibdin was the Director). Autograph Letter Signed to unnamed male correspondent [Lewis Nockalls Cottingham?]. South Ella June 16. 1821'. English book collector (1784-1833), Fellow of the Society of Antiquaries, whose library was auctioned by Robert Harding Evans in 1832 and 1833. One page, 4to. In good condition, with remains of stub adhering to one edge. Autograph Letter Signed to Dr [?] Frazer. 14, John Street, Adelphi, W. C., 24 November 1896.